Have a question or idea for us? We'd love to hear from you! Gerull Labs LLC (G-Labs) Modern Vision Therapy resources for Apple iPad. 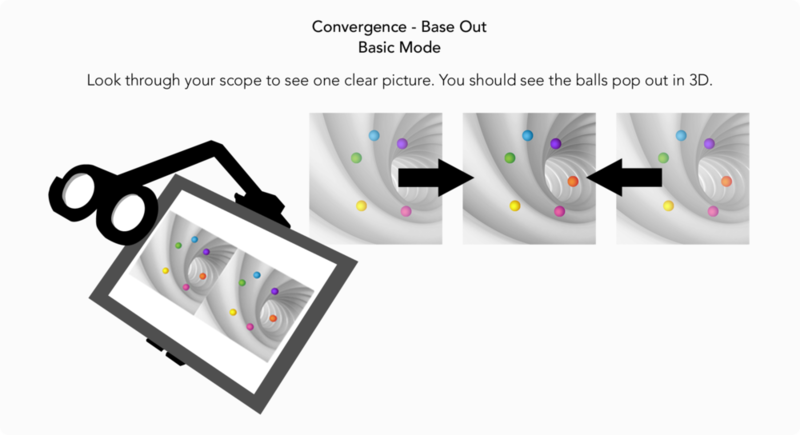 Description of the Divergence 1E exercise in the Opto vision training app for iPad. Developed exclusively for Opto. Available now for iPad! Divergence exercises build accurate eye alignment and sensory fusion. The Divergence 1 series in Opto features colourful 3D vergence targets on a neutral smooth-gradient background. Basic mode: Static image is displayed, with all 6 vergence targets. Interactive mode: User must indicate which target appears closest to them. Once tapped, the target will disappear until all 6 targets have been tapped. The order in which the user taps the targets is saved in the report for the reference of the vision care provider. The report also shows the correct order of the targets for comparison. Dynamic mode: The separation of one target is controlled by the user with a slider. Like all activities in Opto, a report is generated including the date and duration of the exercise. A patient assessment is also recorded if the user is signed into his/her personal profile. To view in HD, watch on YouTube and use the gear icon in the lower right to change to 720p. Download Opto for iPad to access the Divergence 1 series of exercises. Visit Dr. Jen Simonson's Vision Books Site ! Copyright 2018 Gerull Labs LLC.